When I discovered Duolingo, a new platform to learn a language, I thought, hey this is great. I can practice what I’ve learned through Rosetta Stone and compete with friends, but as soon as I started using it I realized Duolingo was much more powerful than I assumed. In fact an independent research company did a study to assess the amount of time a student using Duolingo would need to accomplish the amount of learning found in one semester of a college level language course. The study showed that Duolingo was twice as effective as the leading language learning software available but also took less time to learn what is found in a typical university level language course — all for free. So I decided to do a little more research into Duolingo. What makes it so special? How did the company get started? What is their goal for the future of language learning and what is their business model? It turns out the founder of Duolingo is the guy behind those annoying CAPTCHAs you have to type in when filling out forms online to protect against spammers and there’s more to that story than just anti-spam which you must know before you can fully understand Duolingo’s business model. The team behind CAPTCHA realized that they were draining hours from humankind with their CAPTCHA system so they set out to find a way to use instead of waste that 10 seconds it takes for each CAPTCHA. They came up with a brilliant idea that ties into digitizing books. Digitizing books is the process of scanning books and having a computer index the words, also called Optical Character Recognition or OCR. Older books are more difficult to digitize because the ink is faded and paper is discolored. Because of the CAPTCHA system, millions of people world-wide are already typing words that are hard to see, so the CAPTCHA team joined the process of digitizing books and blocking spam bots. 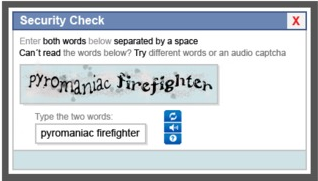 They created a system called ReCAPTCHA that instead of presenting a single word CAPTCHA, you are presented with two words — one word that has already been indexed by OCR technology, and one other word that isn’t. ReCAPTCHA presents the non-indexed word randomly to a few hundred thousand people, combines the most common answer for that word and the computers then learn to recognize it, effectively turning millions of wasted hours worldwide into a crowd sourced book digitizing engine. ReCAPTCHA and you digitize 2.5 Million books per year. Duolingo plays on that same process. They aim to crowd sourced language translation of the Internet. While playing Duolingo, you can test your new language skills with real world translation. You are given a short sentence based on your current skill level and vocabulary in your new language and asked to translate it as best you can, for extra points toward your Duolingo skill profile. To aid your translation efforts, you can mouse-over each word and get the literal translation. After you translate your sentence, you are given the top three most common translations of that sentence and asked to pick the best one. What you may not realize right away is that each of these sentences comes from a real website, real copy somewhere out there on the Internet. That one sentence you just translated will be matched along with the hundreds of thousands of other translations of that same sentence to find the best translation, then it will be applied to whatever document it came from. As a business model, Duolingo provides language learning courses in exchange for translation services. They can sell this translation service to outside companies. The founders don’t plan on ever charging for Duolingo as they state that this is a fair exchange of value and a sustainable business model. As a language enthusiast, I’ve studied half a dozen languages over the past ten years continually. I am not fluent yet, but I can understand much of what is said in Spanish and Japanese, and get by with French and German. I enjoy studying the languages as well as their culture. Throughout my language studies, I have tried every language learning platform around from online offerings like Live Mocha to desktop software including Rosetta Stone to audio learning suites to old school bilingual dictionaries. Duolingo is a step above the rest. Duolingo lessons are much like Rosetta Stone. The software presents a few different models of translation and from those, you learn vocabulary and grammar. You learn to associate pictures with words and translate simple sentences and phrases back and forth between your two languages. As you progress through the language, you unlock more difficult lessons and can’t progress forward until you learn the basics to a certain degree. Compared to Rosetta Stone, Duolingo is smarter. It is flexible when interpreting your answers. It understands English conjunctions and let’s grammatical and spelling errors slide, while showing you the correct grammar in your new language so you learn to recognize and self-correct your translations. Duolingo also allows comments on every answer so the community can correct the software if there is a mistake or add information about lessons. This helps make the new language more real. Duolingo also learns and adjusts your individual courses based on your strengths. Duolingo integrates your current vocabulary and language strengths into earlier lessons which make them dynamic and more difficult. For example, if you went through the Spanish lesson teaching foods and the lesson teaching colors, then went back to a lesson about animals, you would be presented with questions that focused on animals but used colors and foods to change the difficulty of the lesson, combining your vocabulary and knowledge to help you better understand the language. 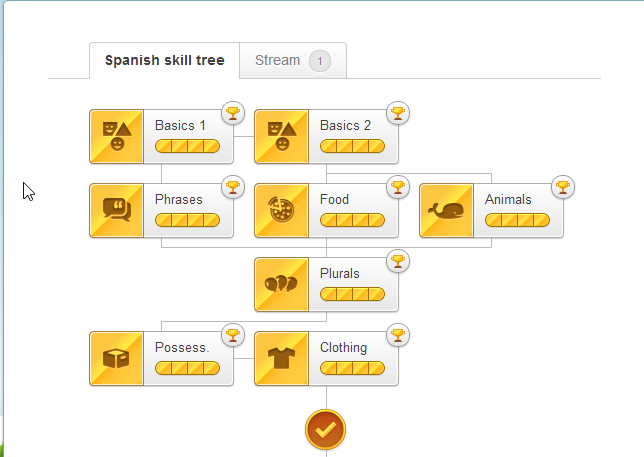 Duolingo’s skill tree is unique compared to the way Rosetta Stone and other software track your progress. You can instantly see how your language skill is progressing, see what the next lessons are and see how many words are solid in your vocabulary. Through this skill tree you can see how well you know each topic as well as test out of topics you may know from previous learning. Compared to online language learning platforms, Duolingo is just as social but also adds unique features that help make learning a new language fun and competitive which in turn motivates users to stick with it. 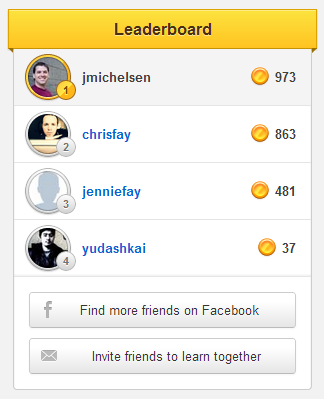 Duolingo’s gamification is excellent. Each lesson you take, each translation you make, each skill you strengthen gives you points toward your Duolingo skill level, which levels up as you progress. You are given a leaderboard so you can see exactly where your friends’ skill levels are, adding competition to the platform. There is an open discussion board, profile Wall to interact with friends and tons of translations to choose from when practicing your skills on real world situations. Another way Duolingo aims to keep you engaged is with email reminders. You can turn notifications off in your profile, but by default, Duolingo emails you daily if you haven’t practiced your language and emails when you’re on a hot streak. You are also sent an email when one of your friends passes you in skill level spurring you back into the race. The Duolingo team very Internet savvy, people who obviously keep up with market trends and understand technology. They have done their research and implemented great features that change the game when it comes to language learning. I can’t wait to see more languages added to Duolingo but even now, the platform is the best way to learn a language, second only to complete immersion. Join me on Duolingo and leave a comment telling me about your language learning experiences! I only tried Duolingo for a moment, but I love the back and forth style of it. It makes me think in both English and Spanish, instead of just Spanish like Rosetta Stone. I won’t be giving my Rosetta Stone up anytime soon, but this is a great addition to it. This is all so interesting. I have just started using duolingo and, I must say, it is amazing! I am using it alongside babbel which seems to be quite little know but it also excellent. Its cool to know that my learning it helping to translate the internet. Don’t believe this is by the same guy who invented the torturous CAPTCHA! I LOATHE those things. I am dyslexic so I can barely read them. Digitising books is a great idea but, it doesn’t remove how frustrated these things make me! Luckily, i have recently found software called RUMOLA (skipinput.com) that reads and fills them in for me so, books can be digitised and I don’t have to go insane! Would recommend to any CAPTCHA haters! I’ve used Babbel in the past two, though at the time I was practicing Japanese which Babbel didn’t have. So I tested it out for Spanish just to see how it was. It’s come a long way since I used it, several years ago and they’ve added a bunch of new languages/features. Thanks for the heads up on RUMOLA, does it let you check the input to verify it too? I have used Duolingo to test out if I could integrate it into the language classes I myself teach on a college level. I truly like the concept of vocabulary building, practicing sentence structure, doing grammar drills and getting progress reports. Coming from the teacher’s side of things, I would love to see a feature that would allow me to integrate vocabulary and sentences that would go along with texts we read in class on a given level. WOuld that be of interest to other people and technically even a possibility at some point?